This is the 2nd tutorial video in a series of ‘basic glass blowing’ and glass studio processes. 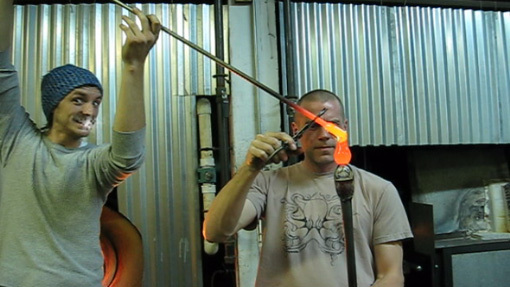 In this video, Bernard Katz narrates as Steve Stens and Chris Wheeler demonstrate how a color overlay is done in glass blowing. The color overlay is one of a few main ways that color is added to clear glass to get colored glass. Tutorial 1 showed what the bar color is that is used in this video. With this method, the color is just a thin layer sandwiched between the layers of clear glass. This gives the illusion that the entire glass vase or glass sculpture is made of that color. You can sometimes see by looking at the lip of a studio art glass vessel the different layers. The color we use is very concentrated, so generally only a small amount is needed to achieve the desired look in the finished piece.